As throughout most of Mesoamerica, Mexico was first planted in coffee during early colonial times, most likely in the late 18th century. Due to the greater attention paid to the region's rich mineral desposits and mining opportunities, however, coffee didn't really develop as an industry until later, especially coming into its own in the late 19th and early 20th centuries, with the redistribution of farms after independence and the emergence of smallholder farmers, specifically those of indigenous origin. In the late 20th century, the Mexican government established a national coffee institution called INMECAFE, which, like the FNC in Colombia and ICAFE in Costa Rica, was developed in order to offer technical assistance, botanical information and material, and financial credits to producers. Unfortunately, INMECAFE was something of a short-lived experiment, and dissolved in 1989, leaving growers with a vacuum in their access to support and resources—especially those in very remote rural areas. This disruption to the infrastructure as well as the coffee crisis that followed the end of the International Coffee Agreement plunged Mexico's coffee farmers into despairing financial times, which of course in turn affected quality dramatically. 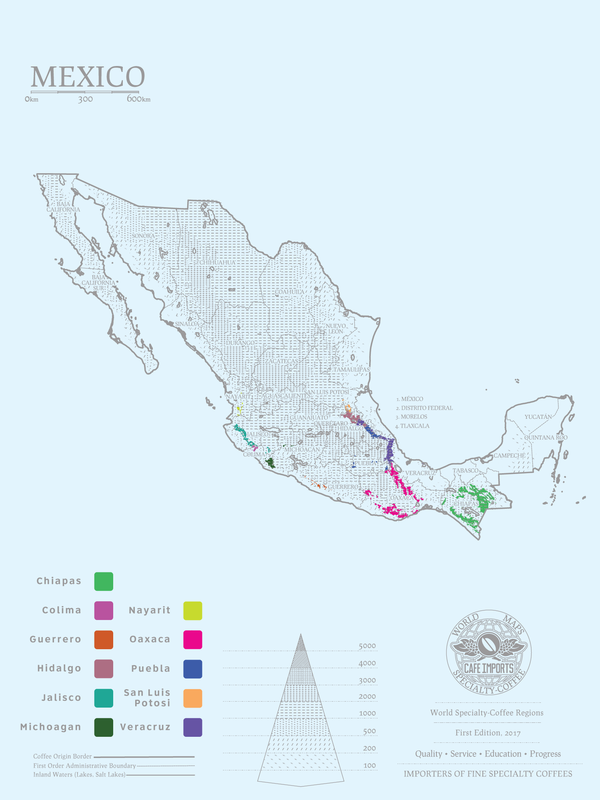 Throughout the 1990s and since the beginning of the 21st century, an increased presence, influence, and focus of Fair Trade and Fairtrade certifications and the emphasis of the democratically run small-farmer cooperative organization has worked to transform the image of Mexican coffee to one that reflects sustainability, affordability, and relatively easy logistics, considering its proximity to the United States. One of the things that has set Mexico's coffee apart is the abundance of both Fair Trade- and organic-certified coffees, especially in areas like Oaxaca, Veracruz, and Chiapas. The strong influence of indigenous groups and cultures has long been the driving force between smallholders' embrace of organic practices, as they are often in line with traditional growing philosophies and utilize similar if not the same techniques. Fair Trade has also done considerable work with regards to encouraging smallholders to organize and operate within cooperatives, which allows them to pool resources, provides better access to credit and financing options, and creates more market presence and leverage in a competitive global economy. In addition, many of the coffees that we at Cafe Imports source from Mexico come from the buffer zones around one of the largest and most forest reserves in the world: El Triunfo Biosphere Reserve. Historically, Mexican coffee was viewed as an inexpensive, low-grown blender with cup characteristics including a nuttiness, chocolate, and generally mild citric acid. However, today, high-grown Mexican coffee has extremely interesting complex citric and malic acidity, balanced sweetness in the form of chocolate and toffee, and an overall clean cup. We've had Mexican coffees that have absolutely knocked our socks off; in fact, some of the Cafe Imports sales staff wax very poetically about the fruity, floral, vanilla-cherry-chocolate cups they've had from here. Being such a large producing country and relatively close to visit, Mexico is bursting with potential. The climate and altitude conditions are excellent for specialty coffee, and every year more efforts are made to not just find it, but improve it, and of course to then protect it from dangers like leaf rust and ojo de gallo. Throughout the countryside you find a number of nurseries hosting stronger, better varieties that will lead to a sustainable focus on quality and consistency. The diversity throughout the country leaves endless possibilities for new, exciting cup profiles. We have been thrilled to find taste characteristics from across the world present in coffees grown so close to home, and we’re only at the beginning of discovering what is possible. Lot separation, altitude separation, variety separation—all are being tried more and more, with great results. We believe that some of the biggest opportunities and the most potential is basically there with our next-door neighbors to the south, and we continue to nurture our relationships with growers there—specifically within the Chiapas region—to empower and encourage them as they continue to overcome the obstacles of the past 15 to 20 years.